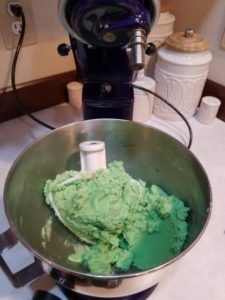 Tis’ the season for everyone’s favorite Christmas cookies and I, like so many others, have a tradition of making cookies for the holiday season. We like to make trays of up all of the various goodies and hand them out to friends, family, or even strangers as a random act of kindness. Making cookies is a great way to get the kids of the family involved, and by handing them out teaching a lesson in kindness, sharing and giving. And who needs a lesson in caring and sharing the most – The Grinch! 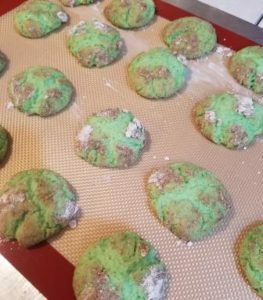 To kick of the holiday baking this year, I took a traditional Snickerdoodle recipe and added some holiday festivities to make a Grinch cookie. It is the perfect mix of a non-traditional Christmas cookie made into a lovable holiday favorite. What better than to make a cookie that represents how the love of the season can make the holidays special for everyone? After making this recipe a couple of times now, I’ve found that If you sprinkle some additional powdered sugar on after the cookies have cooled slightly, it will help brighten the cookies and tone down the cinnamon appearance. 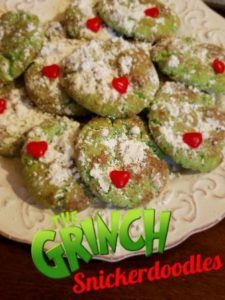 So gather up the ingredients and lets start the our holiday baking with Christmas Cookies that can bring a smile to even The Grinch with these Grinch Snickerdoodles! Heat oven to 400. Line cookie trays with parchment paper or silicone baking mat. Combine Powered Sugar and Cinnamon in a bowl and set aside. Blend butter and shortening until well creamed together. Add sugar and eggs and blend well. In separate bowl, combine flour, cream of tartar, soda and salt. Add slowly to butter mixture and mix thoroughly. Shape into 1” balls. Roll into sugar/cinnamon mixture. Place 1-2” apart on baking tray. Bake 8-10 minutes. 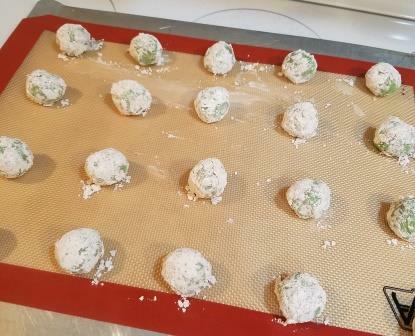 These cookies will puff up at first, and then flatten out as they cool. Once removed from tray, sprinkle with additional powdered sugar and place a press into place a red candy heart. Nutrition: 60 Calories per cookie.